This document applies to LIGHT ION BEAM ME EQUIPMENT when used, for therapy purposes, in human medical practice. This document applies to LIGHT ION BEAM ME EQUIPMENT which delivers LIGHT ION BEAMS with an ENERGY PER NUCLEON in the range 10 MeV/n to 500 MeV/n. This document describes measurements and test procedures to be performed by the MANUFACTURER of LIGHT ION BEAM ME EQUIPMENT but does not specify ACCEPTANCE TESTS. 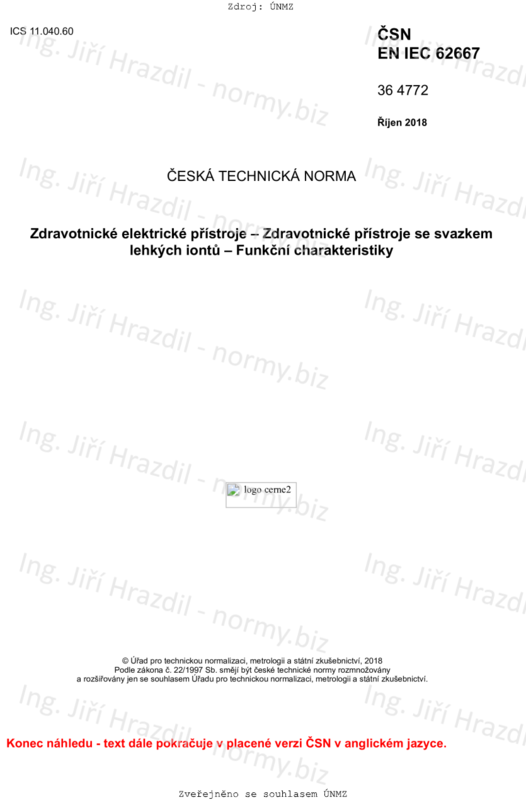 This document specifies test procedures for the determination and disclosure of performance characteristics, knowledge of which is necessary for proper selection, application, and use of LIGHT ION BEAM ME EQUIPMENT and which are to be declared in the ACCOMPANYING DOCUMENTATION together with the greatest deviation or variation to be expected under specific conditions in NORMAL USE. A format for pre-sentation of performance values is given in Annex A. It is recognized that inaccuracies in the test methods can occur when assessing performance. However, it was felt preferable not to combine the errors into an overall performance tolerance but rather to keep them separate in the expectation that more accurate test methods will evolve. It is not intended that this document in any way inhibit the future development of new designs of equipment which may have operating modes and parameters different from those described herein, provided that such equipment achieves equivalent or better levels of performance for the TREATMENT of PATIENTS. This document applies to both ISOCENTRIC and non-ISOCENTRIC GANTRIES but many of the tests assume that the LIGHT ION BEAM ME EQUIPMENT has an ISOCENTRIC GANTRY. Where the equipment is non-ISOCENTRIC, the description of performance and test methods may be suitably adapted.